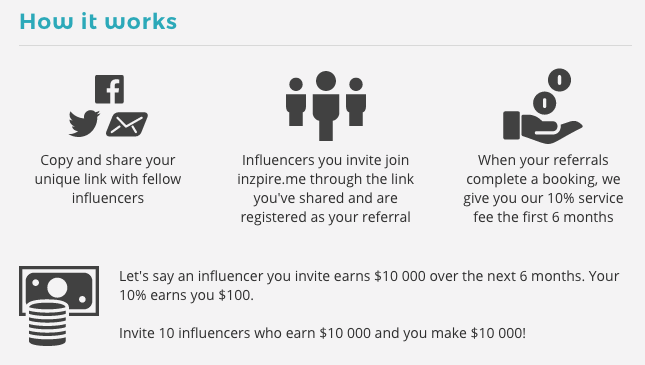 To make inzpire.me truly awesome, we need as many influencers to join us as possible. The more influencers we have, the more brands will join. The more brands we have, the more bookings you may get! That's why your first booking request is from us at inzpire.me! 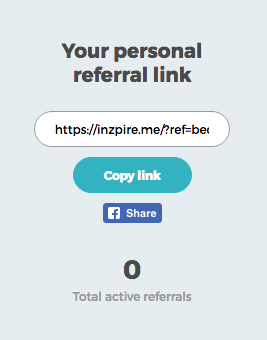 We're asking you to post about inzpire.me in one or more of your channels and encourage fellow influencers to join using the referral link. As payment, we give you 10% of the earnings of all your registered referrals for the first 6 months. That's a pretty sweet deal! Your unique link can be found under Referrals in the Menu bar to the left. Copy your unique link on your site and invite your friends and other influencers to join. We will keep track of how many active referrals you have. You can also check Referral Earnings, so that you can also see how you are doing!